It's the 6th June and I am starting to write my monthly editorial for the community magazines and what stands out this time is that I am sat, researching topics and writing my notes, outside as the last few days we have had lovely warm weather. What also stands out is the positive and happy feeling that the warmer, sunnier weather generates in people. It's noticeable in the office, somehow the stresses and challenges of the day seem more manageable when the weather is good. The banter with the local shop keeper is more upbeat than usual and at the pay desk in the department store the lady serving me adopts a more relaxed and leisurely approach than I am used to. Of course we normally associate sunny and warm weather with our summer holidays - usually planned in advance and something we all look forward to. And what I have found during my research is there is evidence that the 'feel good factor' of a holiday is very real. 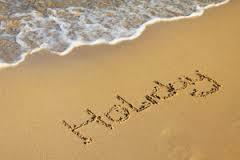 "Physcology Today" reported that we all need a holiday once in a while as all adults have lives that are filled with some form of stress, even if we don't truly acknowledge this fact. We may face the burden of meeting tight deadlines, making crucial decisions or managing the complexities of household demands all of which can take its toll on our physical and mental wellbeing. Even those who claim to enjoy a high-pressured lifestyle wlll admit that there are times when they just want to get away from it all, even for a short time. Holidays have the potential to break our 'stress' cycle and give us 'time-out' from our usual routines. A successful holiday can leave us feeling refreshed and ready to take on the world again. It's also an opportunity to gain perspective on our problems. Luisa Dillner of The Guardian tells us that "The most restorative holidays tend to be the ones that allow people to have time for themselves, choose activities they enjoy, sleep well, excercise and socialise in a warm climate." In the same article we're told that a review of holiday research found that a short break can have the same benefits as a two-week one. The benefits of holidays also extend to family relationships. An international group of researchers led by Purdue University Xinran Lehto concluded that family holidays contribute positively to family bonding, communication and solidarity. Holidays promote something called "crescive bond" (a shared experience). Shared family memories and time spent together isolated from everyday activities such as school, work etc. help to promote these positive ties. Though family holidays can have their own share of stress we're told that the benefits outweigh the risks, even in families that are not paricularly close, according to Lehto and co-authors. So whether you're planning a short staycation in the UK or travelling further afield to gaurantee the weather the feedback from the experts is unanimous - we can all benefit from a holiday.